I got an ask a little while ago on my studyblr asking if I could give a run though of the Norwegian school system, with emphasis on high school. So I thought that would be today’s post. I’m not going to go into university and stuff, because I don’t know anything about that part of the system. So let’s get to it! We start school at six years old, but before that a lot of people go to kindergarden. In kindergarden you basically play all day, draw, paint and whatever. You don’t learn anything and it is not obligatory. When we actually start school, we have three ‘levels’ of schooling. Primary, secondary and high school. Primary school is years 1 to 7, secondary school is years 8 to 10. The year numbers is also what we call the grades. In which school, which is years 11 to 13, we refer to the grades as grade 1, grade 2 and grade 3. It doesn’t really make sense, but that’s how it is. Everyone has to go through Primary and Secondary school. Everyone takes the same subjects, which are mostly Norwegian, English, Science, Human sciences, crafts, woodshop and a third language. You don’t do all of those all years, but everyone should have been through all of them. Also, some schools offer one or two electives in year 10, although these are often ungraded. Also, for primary and secondary school you mostly just go to the school closest to you, unless you need to go to a special school. For example, here I live there is a separate international school for students that don’t speak Norwegian. For high school, you choose the direction you want to go in. You can go to studiespesialiserende, which is basically secondary school all over again, just with more electives. It is a general education. This is what most people do. You can also go into Media and Communication, Sports, Electrician, Healthcare and other things. I actually didn’t go to any of these, as I did the IB program. However, since I still go to a Norwegian school, the IB system is adapted to the Norwegian system and things are still similar. 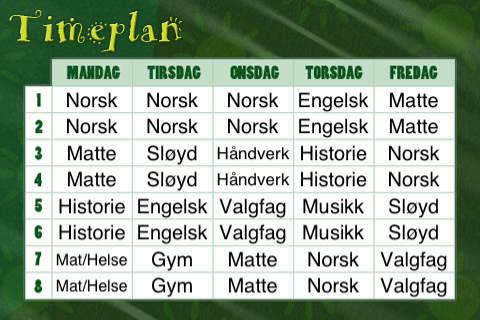 For studiespesialiserende (shortened to studspess or studiespess most of the time), you have Norwegian, English, Social studies, Science, a third language, Gym and Maths your first year. Your second year you have Norwegian, History, Gym, a third language, Maths and two or three electives. Your third year you have Norwegian, History, Religion, Gym and some electives. For your electives you choose either a science based route, a human sciences route, or an economics/languages route. I think you have to have at least two electives within the same group and at least one of them have to be a continuation from second to third year. In Norway they are all over the place. This is just an example I found on google, and I know most of you won’t be able to understand the subject names, but as you can see, no two days are the same. They’re just a bit all over the place. When you get to high school you often have free periods as well, as the time schedule is created individually for every student, based on what electives they are taking and stuff. Also, in high school we don’t have a bell that signal the start of class, compared to primary and secondary school. You just need to memorise when the classes start and be there. Ah, the dreaded homework. I have to admit that I’m not too familiar with how homework is anywhere else, but here in Norway it is pretty chill, at least at the point where I am right now. In Norway, homework isn’t graded. Sometimes we get homework tests, so that you get a test on the stuff that you did homework on, but the homework itself is never graded. Homework mostly consists of continuing work from class, finishing tasks, reading etc. On the other hand we have a lot of hand ins, assignments, mini essays etc that are graded, and these count towards the grade in the subject. So yeah, that’s intense. Also, on the report card you get one grade for order, one for behaviour and all your absence for the three years are written on there. School is free in Norway. Everything is free. For uni you only need to pay a small fee every year that amongst other things cover your exams. For everything else you don’t need to pay anything. In high school we get computers. Every student gets their own. Technically we need to pay for them, about 100 pounds per year for three years, and then they’re all ours. However, from the government and Lånekassa, we get that same amount per year in funding for just going to school. Also, getting the computer is optional, so if you would rather spend your government issued funding on something else, you can. And that funding is the mimumum you can get, so if your parents income is lower than the norm, they are divorced, you have a lot of siblings or fill other criteria, you might be eligible for more funding. And that is it. I officially cannot think of anything more that you guys could be interested in knowing. If you actually made it through this post and have questions, just send me an ask!